After Terror presents sustained reflections by some of the world's most celebrated thinkers on the most pressing question of our time: how can we find ways to defuse the ticking bombs of terrorism and excessive interventions against it? It offers an antidote to the fatalistic global holy war perspective that afflicts much contemporary thought, focusing instead on the principles, issues, and acts needed to shift course from alienation and conflict to a path of sanity and goodwill among cultures and civilizations. The central aim of the book is to advance contemporary thinking on the causes and implications of 9/11 and thus provide the essential elements of a blueprint for humanity. 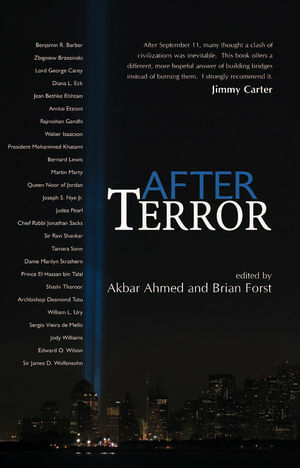 It features 28 original essays by some of the world's leading public figures, scholars, and religious leaders, including Benjamin Barber, Zbigniew Brzezinski, Jean Bethke Elshtain, Amitai Etzioni, Bernard Lewis, Martin Marty, Queen Noor, Joseph Nye, Judea Pearl, Jonathan Sacks, Ravi Shankar, Bishop Desmond Tutu, E.O. Wilson and James D. Wolfensohn. After Terror attests to the power of dialogue and mutual understanding and the possibility of tolerance, respect, cooperation, and commitment. Without ignoring the dangers of the modern world, it points to a future in which people can celebrate both the fundamental sentiments and interests that we share and the diversities that make us human. Akbar Ahmed and Brian Forst, both of the American University, Washington. 19 The Power of Dialogue: Redefining "Us"
23 Clash or Dialogue of Cultures? A major new trade title on one of the hottest topics in current affairs and world politics. Brings together 28 specially commissioned essays by some of the world's most celebrated public figures and political and religious laeders including Bishop Desmond Tutu, George Carey, Jonathan Sacks, Queen Noor of Jordan, Rajmohan Gandhi, Joseph Nye, Benjamin Barber, Ravi Shankar, James D. Wolfensohn and E.O. Wilson, . The pieces are written in a clear and compelling style for a wide readership of opinion leaders, scholars and concerned members of the public. After Terror is also likely to gain adoptions on the increasing number of terrorism courses across the world. As the book explicitly aims to open up dialogue between different culturse and religions, it is likely to attract good media coverage and attention, especially as the editors are hugely successful self-publicists.